There are some things that I just don't feel warrant my extra dollars. Lunch bags fit that category. 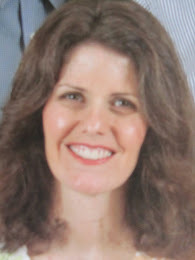 So, in case you don't know, I homeschooled all my 3 kids through the 8th grade. They went on to traditional high school (and my son went on to university, commuting from home). I have only packed school lunches for high school and university. My son used brown paper bags, which we lined with a plastic bread bag, to keep the paper bag in decent enough shape to last a week at a time. They were pretty beat up by week's end. But the plastic did prevent leaky containers from wetting the paper, and then causing tears. When my son moved on to university, I packed his lunches in plastic grocery bags. Those worked fine. He now is employed and has a snazzy fabric lunch bag, good enough that it'll probably last him several years. For my daughters' junior year, we thought we'd do away with the brown paper bags and use reusable bags instead. Dollar Tree had some that looked okay, so we bought 2. 'Round about March they began to tear. I kept them held together with duct tape for the last couple of months of the year. Disappointed, but not at all surprised. Here we are, senior year in high school. 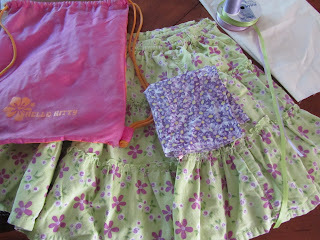 Still wanting lunch bags on the cheap, I decided to sew bags, using fabric scraps and trims I already had. The basic idea is quite simple. I'm making sling-style back packs for lunch totes. I've let the girls choose their own fabric and trim, and how they want it used. They have very particular ideas. One daughter has a very favorite old skirt, that she wore for many, many years. 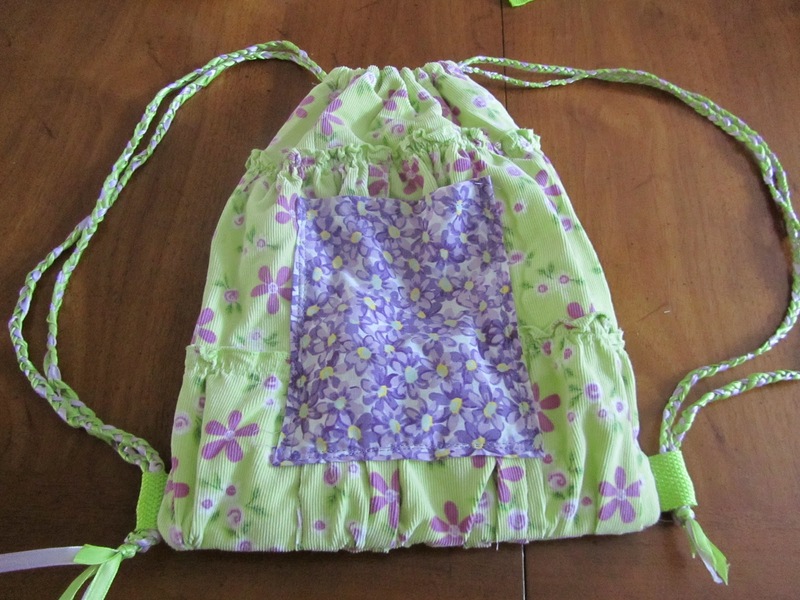 She wanted her lunch tote made from it, with a patch pocket from a dress her Grandma made for her. She wanted the ruffly skirt to be left ruffly looking. That was a challenge. 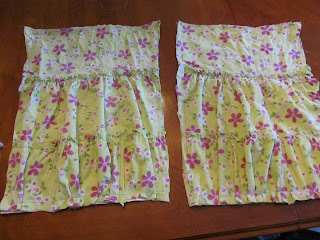 I wound up affixing a block of the ruffly skirt onto a rectangle of muslin, to stabilize the pieces. This worked, thankfully. For a cord drawstring I braided some ribbon that we already had. I think I'll keep my eyes open for some better sort of cord, as I don't see how this ribbon could be durable enough to last the full year. If a sling-style backpack suits you or someone you know. Here's how I made mine. I patterned it off of another sling backpack my daughter had. I made the blocks of fabric about 10 by 14 inches, on the first one, but will do the second one slightly larger, 11 by 15 inches. I think this will be a better size for what we need. 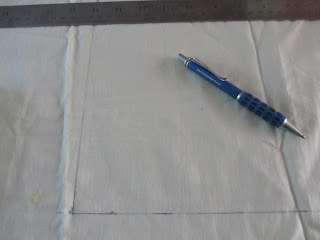 I cut the blocks out and stabilizing the skirt pieces on blocks of muslin, by stitching all around the edges, and through all layers lengthwise in two places. I made the casing for the top on both pieces, turning the edge of the side seam under at the top, before turning the casing under (for a neater edge when finished). With the casing in place, I pinned a small folded-over piece of strapping/webbing in the lower corners, which will be the end piece where my cording is secured. Then I pinned and sewed the two blocks together, right sides facing each other, sewing as close as my machine could to the casing. This left about an inch from the casing, unsewn. I could have stitched this closed by pinching the seam, and machine stitching very close to the edge. 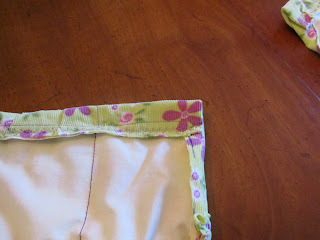 But it was just as easy to hand sew this unsewn 1-inch at the top of the sides. Lastly, I ran cording through the casing, in such a way, that the cord makes a loop around the top edge of the bag through the casing. One cord runs across, through the casing to the other side, then back to it's original side through the other side's casing. This is repeated with the cord from the opposite side of the bag. By having this full loop through the casing, when you pull on the ends of the cords, the drawstring pulls tightly closed. The ends of the cords are then threaded down through the strapping loop, and tied in a large knot. So far, barring any purchases of replacement cords, etc. these lunch totes are absolutely free. I keep reminding myself of that when I remember the frustrating afternoon I spent making them. 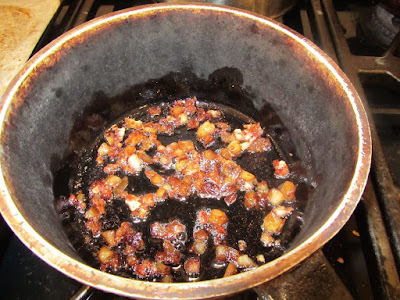 I'm not the Martha Stewart type, where as I finish a project, I stand back and admire my handi-work. No, I see all the faults with my work, think about how difficult it was, and generally feel badly about both my work and my abilities. It's only after several hours, and realizing that my kids (for whom I'm most often creating things) love whatever I make, and don't see the faults that I do, that I begin to think, "okay, so that turned out good enough". And I think I'm more the norm than Martha Stewart where these things are concerned. I am the same way about sewing projects. Others think they are just fine, but I can only see the flaws. That keeps me from doing more where I would actually improve my skills. Also, your kids are lucky that you pack lunches for them. My kids had to pack their own from second grade on carrying on the tradition that my mother started with me. well, the packing of the lunches is now a joint effort between my kids and me. I make sure everything is there for them, and I sometimes will pack things, but mostly my daughters pack right after school each day, for the next day's lunches. When I was on the 4th grade, my mom let me pack my own lunch for the week that she and my dad were on a trip and we had a sitter. I packed ding dongs, pop tarts, punch, potato chips and cookies for the whole week! Word got back to my mom about my not-so-healthy lunches, and I wasn't "allowed" to pack my own lunch for a couple of years after that! Those are cute! We always brown-bagged it as kids. My mother would not have dared let me pack my own lunch, because it would have been like Linus in the Peanuts comic strip--I would have packed eight candy bars. Thank you for this idea, my boys are grown but I have grand children who will be entering school in a couple of years and will be needing lunch bags. I'm going to hold on to your instructions and watch for a favorite piece of clothing to grab when they outgrow it. The back pack/lunch totes were pretty quick and easy to make. I have about a 2 hour time limit to my attention span when it comes to projects, and that's about how long it took to do one. It was a fun way to hang on to outgrown, but much-beloved clothing, too. 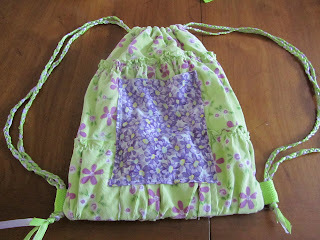 These sling backpacks could also make cute fabric purses, given the right materials and cording. I think anyone who can sew at all is pretty awesome. Mom tried to teach me, but teenage angst got in the way. I can hem and do buttons by hand (and my hand-sewing to fix clothing and stuffed animals has gotten better by default the past few years) but a sewing machine? Nope. What do you do with lunch items that need to be kept cold? 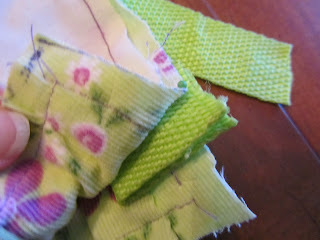 I think the most useful of sewing skills is attaching buttons, hemming and mending torn seams, all of which can be done by hand. And you've got that down! So that's great that you can do those things. Think of all the clothing and items you've rescued using those skills. I've known people who couldn't sew on buttons and just gave away clothes that popped a button! For lunches, most of what I pack can be kept at room temp for a few hours. I don't pack any meat items in kids' lunches. I save any meaty leftovers for my husband's lunches as he has a fridge and microwave. I will occasionally pack cheese, yogurt or hard-boiled eggs in kids' lunches, but feel okay with them eating those at room temp. They do have a fridge, if they want to store something there. But for the most part, they forget to do that. Any soup I pack is a vegetable based soup, which they reheat in the microwave. We also have a nice selection of cold packs in the freezer. Some are small and would be great for lunches. But no one ever thinks to use them. So, to sum up, I guess I don't do much of anything for items that need to be kept cold! Except, i just don't send anything that could cause a bad food-borne illness. I've used bread bags to line sneakers and boots in the snow, when my kids have had less than great footwear, to keep their feet dry. It doesn't snow all that much here, so snow boots are not always at the top of our list. Thanks! I hope so. But mostly, I like being able to "save" something special for my kids, in a way that they get to see it often. These are so cute!! What a great idea and I love that they are Eco Friendly!! Thanks! Definitely eco-friendly! And hopefully, they'll see many lunches!